He may be a perpetual man-child, but Pee-wee Herman has been around for nearly four decades (the character made his first appearance in 1977). His first (and so far best) feature film, Pee-wee’s Big Adventure, debuted on August 9, 1985. Since then, millions of people have no doubt pondered the question, "Does the Alamo have a basement?" The answer is, yes! 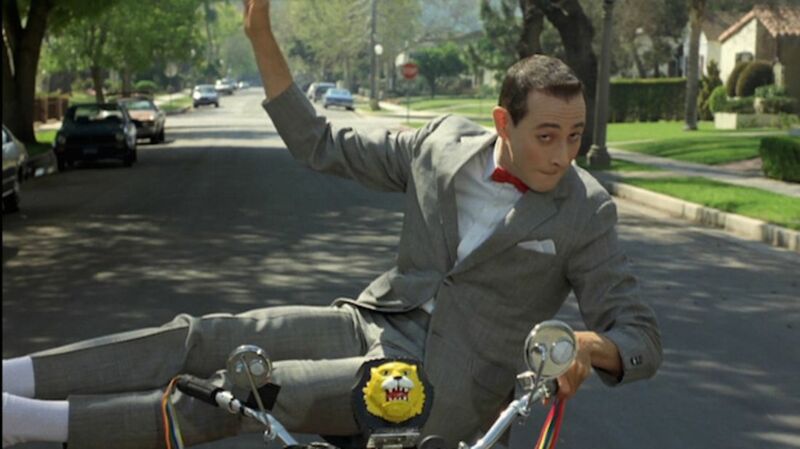 Read on for more fascinating facts about Pee-wee and his big adventure. 1. The movie was originally supposed to be a remake of Pollyanna. Before the inspiration struck for the quest for Pee-wee’s missing bicycle, the writers planned on more or less remaking the Disney classic Pollyanna. Pee-wee would arrive in a new town in need of some fresh perspective, and by the end of the movie, he would have endeared himself to even the most curmudgeonly of the citizens. 2. And then, Warner Bros. gave Reubens a Schwinn. Cast and crew members often take bicycles around studio lots to get from point A to point B. Reubens was given a 1940s Schwinn to ride while he was at Warner Bros. working on the movie script; he loved it so much he decided to retool the whole Pollyanna concept. 3. It’s a retelling of The Bicycle Thief. 5. Reubens fought to get a 26-year-old Tim Burton to direct. Although Paul Reubens had a long list of directors he wanted to work with, the studio chose one not on the list. Rather than go along for the sake of getting the movie made, Reubens put his foot down and refused to proceed. Shortly thereafter, one of Reubens’ friends mentioned a short film called Frankenweenie (the precursor to the feature-length movie that came out a few years ago) by Tim Burton. Reubens was friends with Shelley Duvall, who was in the Burton film, so he gave her a call. She agreed that Reubens and Burton would make a perfect match, and the connection was made. “It was the biggest piece of luck early on in my career that I could have had,” Reubens later said. 6. It was the first Tim Burton-Danny Elfman collaboration. Not only was it Tim Burton’s first big movie; it was also Danny Elfman’s. Elfman wasn’t actually scoring films at the time, at least not on the scale that he is now. But Burton knew him through his work with Oingo Boingo, and Paul Reubens knew him from music he had written for a film called Forbidden Zone. After meeting with Burton to chat about the project, Elfman went home with a tune in his head. “I did a demo on a four track tape player, playing all the parts, and I made a cassette and sent it to him and never expected to hear from him again. But that piece of music became the main title of Pee-wee’s Big Adventure, and it got me the job. I was really shocked.” It was, of course, the beginning of a longtime collaboration and friendship. 7. Tim Burton has a cameo. 8. Elizabeth Daily, a.k.a. Dottie, is the voice of Tommy Pickles. In addition to acting in front of the camera, Elizabeth Daily is also a talented voice actress. If you don’t know her as Tommy Pickles in Rugrats or Buttercup in The Powerpuff Girls, you’ve probably heard her in a number of small roles in Wreck-It Ralph, Happy Feet, and many, many more. She was also on The Voice a couple of seasons ago. 9. Warner Bros. thought the movie was weird. After seeing the finished product, the studio wasn’t so sure it wanted to put much more money behind it. Finding it all a bit bizarre, they decided to roll the film out slowly and on a regional basis. When it proved to be popular with even a limited audience, Warner cranked up the publicity machine. By the time all was said and done, Pee-wee had earned nearly $41 million at the box office. 10. Phil Hartman co-wrote the script. Reubens and SNL legend Phil Hartman originally developed the Pee-wee character when they were in the Groundlings together. HBO picked up Pee-wee for a comedy show in 1981, which is what eventually led to the movie in 1985. Hartman was Reubens’ writing partner throughout all of that, and also for Pee-wee’s Playhouse, where he made occasional appearances as Kap’n Karl. 11. Pee-Wee’s Bicycle was sold on eBay last year. Though Pee-wee estimated his bike’s value at “a hundred million, trillion, billion dollars” in the movie, it didn’t quite fetch that much when it was sold on eBay in 2014. It did, however, sell for $36,600. 12. There were at least 10 bikes used in the movie. Missed out on the auction? Never fear—there could still be an authentic Pee-wee bike in your future, since at least 10 bikes were built for use in the film. The Carnegie Science Center in Pittsburgh had one of them on display for a while. 14. The idea for a TV show came up at the movie’s premiere. Executives at CBS approached Reubens’ manager at the movie's premiere and wanted to know if “Pee-wee” was interested in doing a cartoon show. But Reubens had another format in mind, and asked how they would feel about something live-action. “I was thinking about how important all those kids’ shows were to me when I was a kid, and how much I feel like they affected me, and that just seemed really exciting to me," he said. "I was really excited by the idea that doing a real kids’ show could potentially affect kids in an amazingly positive and great way.” Pee-wee’s Playhouse debuted a year later. 15. Large Marge almost got the axe. It’s one of the most memorable scenes in the entire movie, but it almost didn’t make it to the screen. “I almost cut the best thing before an audience saw it,” Burton said in Burton on Burton. “It was a special effect and those are the first things to go.” IFC lists the scene as #5 on their list of "25 Scariest Moments in Non-Horror Movies."